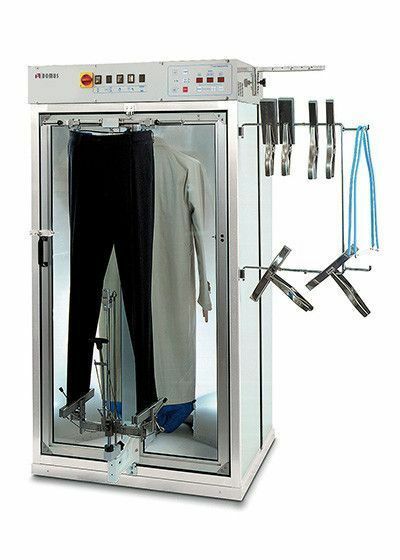 Cabinet supplied as standard with one trouser finishing device and one form finisher for jackets, coats, dresses, etc. Supplied complete with all the necessary accessories for the finishing of the trousers and of the jackets and coats (dummy, trousers waist band stretcher, curved clamp for jackets, straight trouser clamps, vertical clamps, multiple connection, wooden and silicon sleeve stretchers). Controlled by an easy to use microprocessor, capable of running up to nine fully automatic programs, amendable by the user. Automatic starting cycle after closing the door. Complete with built-in steam boiler, 16 litres, with automatic water feeding and automatic pressure control (4,5 bar).